New Jersey’s 7th district is a precarious one for Republicans: a blue-shifting seat in what appears to be a decently favorable cycle to Democrats. While longtime moderate Republican incumbents Frank LoBiondo and district neighbor Rodney Frelinghuysen bailed out, Leonard Lance remained in for the fight of his political life. Indeed, his seat could be one of the first to flip, possibly even over other open ones. In the paragraphs that follow, I’ll show how the Republican decline in New Jersey’s 7th has happened at all levels and how in this state, at this time, Leonard Lance may not be able to hold on. When you drill down, the red flags pop up all over the place, and the battle for this seat could come down to a struggle worth millions of dollars over one county. New Jersey’s 7th district rests in the northern part of the state, hitting the Western border with Pennsylvania and stretching over into the center, with a lot of the northern parts added in in the latest redistricting cycle when New Jersey had to cannibalize a seat due to population loss. Lance’s long history and past position as Minority Leader of the State Senate before becoming a Congressman meant that his seat wasn’t in too much danger, and at the redraw it absorbed a few more Republican areas. As you will see in the next section, this came back to bite him a bit, with reliance on the upscale suburbs that traditionally had voted Republican but have pivoted hard in the Trump era. It includes all of Hunterdon County, large chunks of Somerset and Union, a bit of Morris, then a smidge of Warren and Essex. The seat as of today has a 54% chance of staying GOP according to the Øptimus legislative model. The biggest contributing variables in the model are money parity and a slight polling lead by the democrat. There has been very little variation in the voting centers for a while, even with redistricting, as the chart below shows. Hunterdon and Morris were the most affected, but each just barely. Somerset is the largest of the counties, consistently accounting for just under a third of the total vote, while Union county takes a little more than a quarter of the vote. Next is Hunterdon with about a fifth, while Morris hovers around 15%. Warren and Essex Counties account for the tiny remainer, which may be crucial in a close race but do not hold nearly as much sway as the others. The new municipalities Lance took in after redistricting were also some that swung hardest from the last election, and NJ-7 was the biggest swing in the state in raw share from Trump’s to Romney’s by about five and a half points. Almost all parts saw a shift, but it seems especially prominent in the largest counties, Union and Somerset. Now, Clinton did improve on Obama’s share by only 2%, but this was also the district where third parties did the best. Gary Johnson took 2.62%, above his 1.86% statewide and about 1,800 more votes than he got in any other district. Jill Stein also did well here, taking 3,597 votes. This was just the latest in a pattern with this district. In 2009, as Chris Christie won his first term with 48.42% statewide, he won the district with 59.91%, an 11.5% lean to the area. 2012 looked similar, as Romney won the area with 52.55% while he lost the state, only taking 40.50%, a similar 12-point over performance. 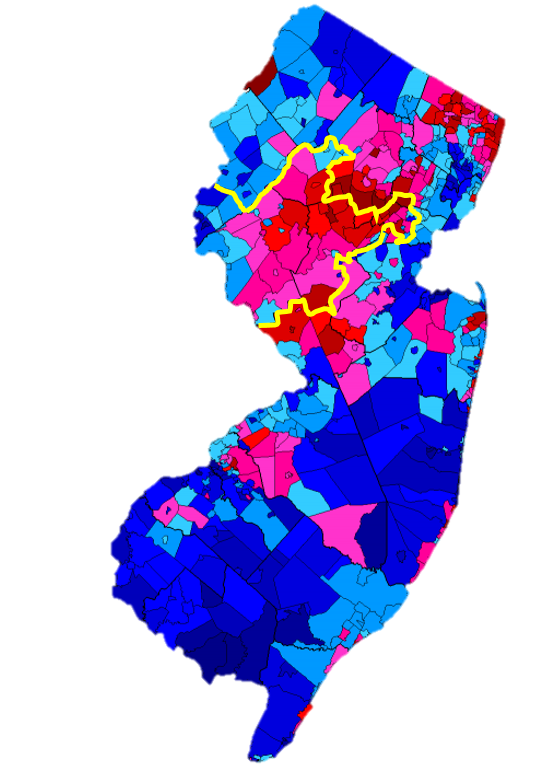 In 2013, it was Christie’s best district, and the Governor won 69.61% compared to is 60.24% statewide. The district leaned only nine points over, a slight down tick in lean. In 2016, Trump won 41.00%, around the same as Romney, but only got 47.11% in NJ-7, a 6.11% lean and considerable drop in comparative partisan shift. The chart below shows the lean of each county’s vote in the district compared to the statewide performance. Union, Hunterdon, and Morris fell a bit in Christie’s second run in 2013, but the decrease was countered by a stable Somerset lean. While Morris and Hunterdon stayed low in 2016, Union took another 4% hit and Somerset dropped as well. The Warren portion, though small, continues a Republican leaning trend. The uptick here for Republicans occurred during the low turnout 2017 governor election, where Republican gubernatorial candidate Kim Guadagno won this district with 52.2% of the vote (ten points better than statewide). A huge reason for that is shown below, which depicts the results in the 2016 Presidential election (left) and the 2017 Gubernatorial election (right) in the NJ-7 portion of Somerset county. The line graph above shows the Somerset rebound, and the map shows the larger areas that went Clinton-Guadagno. I’m skeptical that any GOP “comeback” in the county is anything beyond an artifact of a low turnout race: the midterm election will likely be a referendum on Trump and probably reflect the 2016 results more. However, expect to see the fiercest action in these townships as the parties compete for votes. An examination of the third party votes reveals something striking about Somerset. Third party performance was down across the state, but it followed a clear pattern. The chart below shows the relative combined minor party performance relative to the past, while the y axis is the margin shift from Romney in 2012 to Trump. You can see that Somerset falls way below the trend line, indicating that it was not third-party performance that caused the shift, but an actual flipping of votes. Another data point that points to the likelihood of these seat this to flip is the downballot shift that accompanied the margin change at the presidential level. In the past, Lance had won with more, taking 57.2% in 2012 and 59.3% in 2014. However, in 2016, he only took 54.08% against a weak challenger that didn’t spend a lot, a more telling sign that Lance may be at the mercy of more national forces. The chart below plots out on the x-axis the swing from Romney’s share to Trump in the district and then the change in the GOP congressperson’s vote share from 2012 to 2016 for comparison. Lance hardly overperforms, and you can see Trump’s weak performance overall. The only two bigger shifts were in the most Republican seat NJ-4 and NJ-5 which flipped in 2016. The inability to maintain his performance while Trump lurched is a bit ominous heading into this midterm. Leonard Lance has been a mainstay in New Jersey politics for almost three decades now, having served in the General Assembly from 1991-2001 and then as a state senator until 2008, when he jumped up to Congress. As a state legislator, he was known for occasionally bucking his party and cultivated a moderate reputation as a Minority Leader for his last couple of cycles in state politics. This served him well, as he won by 10 points in the 2008 election even while then-Senator Barack Obama won his district in the Presidential election. Sensing the Tea Party shift and knowing he would face a challenger, he shifted rightward, primarily on his opposition to the Affordable Care Act and federal funding for abortion, both positions he maintains currently. He had been challenged in the primary by the same guy, small business owner David Larsen, for four cycles in a row, winning 56-31 in 2010, 61-39 in 2012, 54-46 in 2014, and finally 54-33 in 2016. Lance faced token opposition this year and won his primary handily, taking 75% of the vote. While he voted for the AHCA, he opposed the tax reform bill based on its effects on SALT and the New Jersey tax burden. As of the second quarter, Lance had raised $1.5 million and spent $544,000, leaving him with a little over a million still on hand. The Congressional Leadership Fund, the deep pocketed SuperPAC associated with Paul Ryan, has a field office in the district and recently turned some attention to it with digital ads directed within. While looking initially competitive and with plenty of candidates fundraising, one by one by one by one the candidates began to fall away in deference to the eventual winner, Tom Malinowski. He, like Lance, has a storied career, ranging from globetrotting research scientist to Senior Director on the National Security Council to the Washington Director for Human Rights Watch. In 2013, he became Obama’s Assistant Secretary for Democracy, Human Rights, and Labor and continuing his primary fight against torture. He made the news in 2014 when he met with the opposition party in Bahrain and was kicked out of the country. Since the 2016 election, he has been lobbying to prevent the lifting of sanctions of Russia put in place following its invasion of Crimea. His prestige and connections allowed him to push out as the clear favorite from a crowded primary, raised him over two million dollars and earned him 67% in the June primary. The Libertarian Party is running Daniel Krause for the seat, who appears to have virtually no online presence. He had run last year for an Assembly seat under the party line and garnered only 938 votes. It is not likely that he will much of an impact, however the Libertarian candidate has taken about 1.5 to 2% of the vote in the last few contests here, a potential spoiling margin in a close race. Fun fact: While only active one cycle, the old NJ-7 housed Dean Greco’s All Day Breakfast Party received 3,259 votes (1.1%) in 2008 as an inoffensive way to teach students about civics and ballot access. I had hesitated to put out any Garden State seat write-ups for a while because the prediction for the Republicans were so consistently bad it almost seemed like overkill. Back in February, I published this screenshot of the very tentative results of my own model, and you can see virtually all of the New Jersey seats were blue in the run, extremely bearish for Republicans. The April Monmouth poll seemed to confirm my suspicions about the environment in the Garden State. First, it found Trump’s approval at just 34% (he won 41% of the vote in 2016). Second, it found a 19-point edge for Democrats in the generic ballot, more than double their performing margin in 2016. A more recent poll, by the Democratic firm Greenberg Quinlan Rosner, found Malinowski edging Lance by two points. Lance’s incumbency could be helping him blunt the overall environment, but it will only go so far. The current 0ptimus model run gives him a 55% chance of holding the seat. New Jersey’s 7th has all the hallmarks of a relatively easy flip opportunity in a wave. Anything less than the dam bursting, Lance remains in the game, so long as he runs ahead of recent Republican erosion in places like Somerset.